All you need in one kit to start your non-residential recovery ministry. 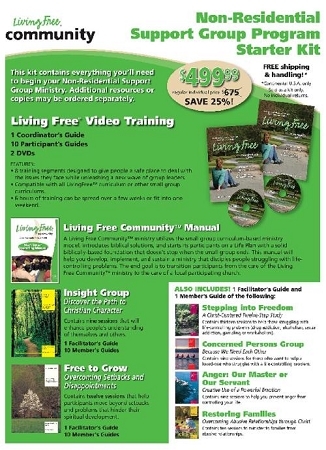 Includes the Living Free DVD training for facilitators and ministry leaders (1 Coordinator's Guide and 10 Participant's Guides, a Living Free Community Start-up and Operating Manual, 1 Insight Facilitator's Guide and 10 Insight Group Member Guides, 1 Free To Grow Facilitator's Guide and 10 Free to Grow Group Member Guides, and 1 Facilitator and Group Member Guide for Stepping into Freedom, Concerned Persons, Anger: Our Master or Our Servant and Restoring Families. That is 43 books plus the DVD training seminar. And that is not all. 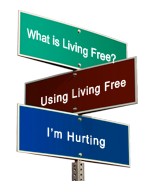 When ordering this Living Free Community Starter Kit, you will receive free shipping to addresses within the Continental U.S. *Sold as a kit only. No individual book returns.